On November 29, the authors of the civilian-military coup d’état who seized power in Honduras five months earlier held a pseudo-election designed to legitimize the dictatorship. The exercise was staged as plebiscite, typical of bonapartist, military/police regimes, and was accompanied by massive repression. The workers, peasants, teachers and other defenders of democratic rights who since June 28 have courageously resisted the coup called on the Honduran population to boycott the electoral farce. In the days leading up to the event and on the day of the voting, the streets were flooded with soldiers, police and thousands of army reservists. Nevertheless, in the commercial and industrial center of the country, San Pedro Sula, hundreds of opponents of the coup braved the batons, pepper gas and rifles of elite police units to denounce the gunpoint “elections.” Scores were arrested and many badly beaten. In the poor barrios of the capital Tegucigalpa and major towns and in the countryside, the call “don’t vote” was widely followed and people massively stayed home. Only in well-to-do neighborhoods were there lines of voters. Resistance groups calculated the overall rate of abstention at over 65 percent. The official electoral tribunal quickly claimed that exactly 61.3 percent of eligible voters cast ballots ... but it could not report any results due to “technical failures” of the vote counting system. Even the election observers authorized by the regime, Hagamos Democracia (Let’s Make Democracy), a “non-governmental organization” funded by the U.S. National Endowment for Democracy (NED), reported an abstention rate of more than 52 percent. Whatever the actual numbers, it is clear that at least 2 million people stayed away from the polls, a significant number in a country where voting is obligatory and boycotters have every reason to fear that they could suffer serious consequences for their act of defiance. This was immediately made clear with a wave of disappearances and murders of resistance activists within a week of the vote, particularly in the plebeian colonias (neighborhoods) of the capital. In the early morning hours of December 4, Walter Tróchez, a noted human rights activist and defender of gay and lesbian rights, was kidnapped, but managed to escape. That same day, five resistance activists were seized in Colonia Nueva Capital by men in the uniform of the National Criminal Investigation Department (DNIC). One of the victims, Santos Corrales García, was found dead several days later, his body decapitated. On December 5, gunmen stormed into the offices of El Libertador, the only newspaper that opposed the coup, threatening the personnel and seizing computers and cameras. On December 6, five youths, all of them active in the resistance, were shot to death in Colonia Villanueva. On December 13, Tróchez was gunned down from a car without license plates in the center of Tegucigalpa. The death squads are back. Despite the bloody repression, the groups leading the resistance to the coup regime vowed to continue the struggle. The day after the vote, a “caravan of victory” of hundreds of cars drove through the capital declaring the failure of the mockery of an election. On December 4, the National Front of Resistance to the Coup held an assembly in the STIBYS (bottling wokrers) union hall that declared that the fight to restore Zelaya had now passed. The Front emphasized, “We are a real power, which has been constituted throughout the country in grassroots organizations” and called to struggle for a “national constituent assembly” and “participatory democracy.” By all accounts, a movement of mass resistance to the arrogant and greedy rulers has taken root in this impoverished Central American country which previously had the smallest organized left in the region. That it was able to hold out for months despite vicious police and military attacks was something the coup plotters had not counted on, and which continues to worry them. 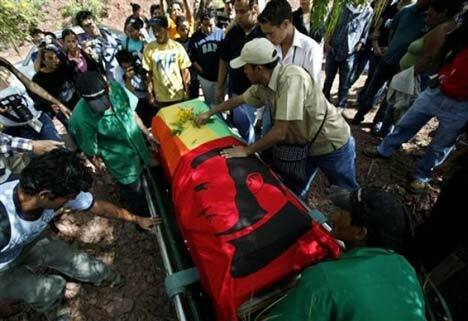 However, even though it was based in the trade unions, peasant organizations, women’s and gay rights groups and organizations of indigenous peoples and the black Garífuna population, politically this movement was tied to Zelaya and other bourgeois politicians and parties. This “popular front” stood in the way of mobilizing the workers and urban and rural poor on a class basis, thus preventing them from attacking the root cause of the endless coups and military dictatorships that have beset the region for the last century: capitalism. Zelaya’s acceptance of the U.S.-imposed “accord” for “dialogue” with the coup regime ruled out any effort to overthrow it, and some of minor bourgeois parties (such as the leadership of Unificación Democrática) in the end participated in the coup regime’s electoral circus. Although the Resistance Front declared this “chapter” of the struggle closed, it is wedded to popular-front bourgeois politics, such as its call for “participatory democracy” through a constituent assembly. Most Latin American governments announced beforehand that they would not recognize the results of the phony elections and called for President Manuel Zelaya Rosales to be restored to his position. The U.S. administration of Barack Obama, however, used the vote to put an end to its charade of supposedly supporting a “dialogue” between the coup regime and Zelaya while giving de facto support to the dictatorship. The State Department called on all governments to recognize the results of the Honduran “elections” and the victor, Porfirio Lobo of the right-wing National Party. Costa Rican president Oscar Arías, Washington’s long-time asset in the region, was already on board. He was joined by Salvadoran Mario Funes, who ever since being elected president as the candidate of the Farabundo Martí National Liberation Front has sought unity with the ultra-right. Soon the continental bourgeois support for Zelaya began to buckle. We warned from the beginning against any appeals to Obama to oppose the coup, which was “made in U.S.A.” The fact that the coup plotters were able to keep their grip on state power with the now open backing of Yankee imperialism is a defeat for the exploited and oppressed of Honduras, and a threat to democratic rights throughout the continent. While escalating the U.S. war on Afghanistan and Pakistan, the Democratic Party administration in Washington has given a green light to ultra-rightist coup plotters and militarists in Latin America. Bourgeois nationalist governments such as Venezuela and Bolivia, and even the most “moderate” liberal governments could soon find themselves facing reactionary military threats from within and without. The League for the Fourth International called throughout for independent labor mobilization to defeat the gorila (reactionary militarist) coup, and for a revolutionary workers party. While fighting alongside those seeking to restore the ousted Liberal president, we warned against any political support to the bourgeoisie and instead proclaimed as our goal a workers and peasants government. Trade union supporters of the LFI sections in the United States and Brazil actively sought with some success in education unions to provide material support to the Honduran teachers unions, who in conditions of extreme danger and deprivation played a leading role in resisting the coup. Underscoring our call for workers action, the Internationalist Group/U.S., the Liga Quarta-Internacionalista do Brasil and the Comitê de Luta Classista (union tendency associated with the LQB) also made significant donations to the Honduran unions in their own right.